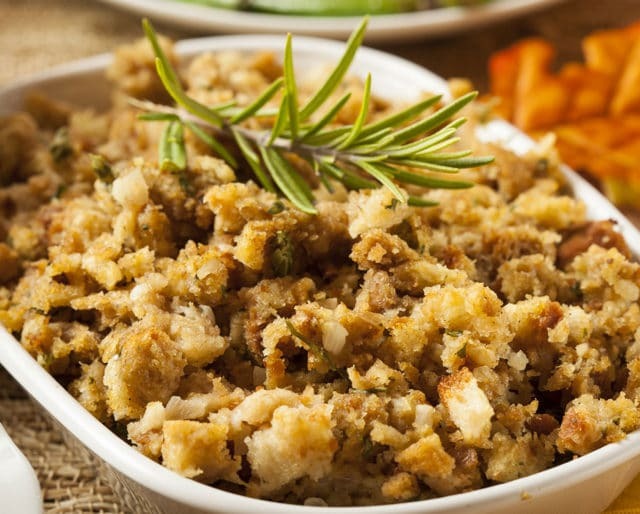 Stuffing is a major player in the world of Thanksgiving. Let’s face it: chicken and turkey can pop up at any time of the year, but when we want to dress those birds up, there’s just no substitute for some good ol’ carbyfilling. Even better, stuffing comes in all shapes and sizes. There are no hard and fast rules about what constitutes it—it can be bread, any kind of bread, rice, quinoa, and even matzo. There’s only one hard and fast stuffing rule: mix some ingredients, stuff it inside a cavity of another food item, and voila! Make no bones about it—it’s delicious. That’s why, on November 21, we celebrate National Stuffing Day! Invite friends or family to come for a stuffing tasting party. Not only can others pre-test their stuffing, but also a whole group of people can benefit from it! Plus, who ever argued with getting to try lots of stuffing varieties? Who knows—one of your friends might have your next greatholiday recipe. There's a whole world of stuffing out there, and yet, we only tend to make it for the holidays. Today's the day to stray away from that boring turkey stuffing and try some of the other varieties. If anyone in your family turns up their noses, tell them you made it all for yourself and you're not sharing! Go back into vintage Julia-Child-Land and watch her make stuffing. Go to your favorite food blogger's page and see what heor she has kicking in the recipe department! There's no shortage of places to look for stuffing inspiration. So get onto that internet and go crazy. With Thanksgiving just around the corner, today is the day to perfect your stuffing recipe. Making a traditional apple and onion stuffing? Use today to hone your ratios of caramelized onions to tart apples to thyme. Or, if you're hosting a holiday for the first time, test that fabulous stuffing recipe before it’s too late. Do you want a simple formula for making stuffing? Here it is: Start with a grain, add liquid and/or fat, spices and herbs and something with flavor and texture. For example, start with cooked rice, add chicken stock, season with thyme, garlic, marjoram, salt and pepper and add dried cherries and cranberries with a sprinkling of chopped walnuts. Stuff the whole mixture into pork chops and you have stuffed pork chops! Are you more of a traditionalist? Start with cubed stale bread, add turkey stock and melted butter. Throw in some rosemary and parsley, and cube some apples for texture. Mix together and stuff the entire mixture into your favorite member of the fowl family. Roast and relax until dinner is ready! With the holidays on the way, you're going to need some serious refrigerator space. Stuffing is a great way to use up some of the leftovers taking up valuable refrigerator real estate. Take those croutons left over from last week’s salad, a little butter, those sad looking celery stalks and half an onion and mix it together using a little hot water and stuff them into those red peppers that are going to go bad if you don’t use them soon. Pop the whole the whole thing into a casserole dish with a little oliveoil on top and bake in a hot oven and no one will ever guess that last night’s leftovers have become tonight’s dinner. You’re a culinary superstar!